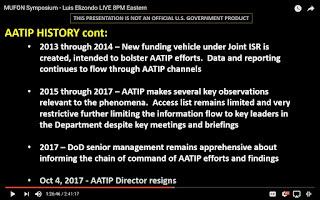 Yesterday, I complied a blog post on how four DoD spokespersons; namely Crosson; White; Ochoa and Harris, had communicated aspects of the AATIP to both media and UAP researchers. This morning, while reviewing the extensive amount of material written about the AATIP, I came across much more information sourced to DoD spokesperson Harris. To the Stars did show WIRED some paperwork suggesting that the videos had gone through the Defense Office of Prepublication and Security Review (DOPSR).. "It means that one of the steps for the review of the product has been completed, says the Pentagon's Harris. But that documentation doesn't actually clear material for release. An approval from DOPSR does not equate to public release approval, says Harris. " 1. As will be seen from a comparison of the words quoted as coming from Harris, versus the text of emails to US researcher John Greenwald, and Swedish researcher Roger Glassel, (cited in yesterday's blog post); we now know, that the text of Glassel's email from Harris, had been revealed by WIRED in February 2018. This was ahead of Greenwald's April email from Harris; and also ahead of Glassel's May email from Harris. 2. A question still remains in my mind, as to where the words "aerodynamic vehicles engaged in extreme maneuvers, with unique phenenomology," comes from? Typing these words into Internet search engines reveals only references by UAP researchers, nothing from the DoD. The story was broken to the world, by almost simultaneous articles in the New York Times and Politico magazine. So I started off my research with these publications. "In response to questions from The Times, Pentagon officials this month acknowledged the existence of the program...It was determined that there were other, higher priority issues that merited funding and it was in the best interest of the DoD to make a change, Pentagon spokesman Thomas Crosson, said in email, referring to the Department of Defense..."
"Helene met with a Pentagon spokesman on Dec 8 for a response to the information we had gathered. The answer came swiftly. There had been a program to investigate U.F.O.s, but it ended in 2012, after five years the Defense Department insisted." A search of Linkedin, found a profile for Thomas Crosson. In December 2017 he was a Spokesperson & Press Officer, Office of the Secretary of Defense. 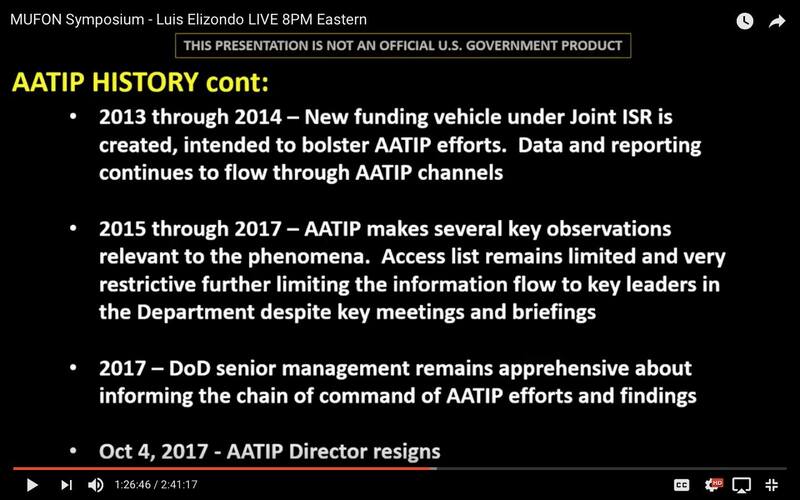 "The origins of the program, the existence of which the Pentagon confirmed on Friday...According to a Pentagon official, the AATIP program was ended "in the 2012 time frame"...Pentagon spokeswoman Dana White confirmed to Politico that the program existed and was run by Elizondo. But she could not say how long he was in charge of it and declined to answer detailed questions about the office or its work citing concerns about the closely held nature of the program..."The Advanced Aviation Threat Identification Program ended in the 2012 time frame," White said. "It was determined that there were other, higher priority issues that merited funding and it was in the best interest of the DoD to make a change. "...White added "The DoD takes seriously all threats and potential threats to our people, our assets, and our mission and takes action whenever credible information is developed." "
Dana White has a profile on LinkedIn, which shows that in December 2017, she was the Assistant to the Secretary of Defense for Public Affairs, in Washington. White also has an extensive official DoD biography. "The Pentagon openly acknowledged the fate of the programme. 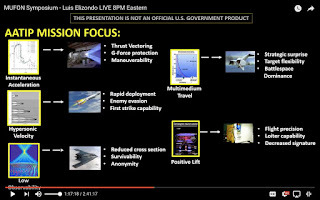 "The Advanced Aviation Threat Identification Programme ended in the 2012 time frame," Laura Ochoa, a spokeswoman said, "It was determined that there were other, higher priority issues that merited funding and it was in the best interest of the Department of Defense to make a change." The DoD takes seriously all threats and potential threats to our people, our assets, and our mission and takes action whenever credible information is developed," Ms Ochoa said." LinkedIn provided the information, that in December 2017, Laura Ochoa was a Spokesperson for Personnel and Readiness Policy, in the Office of the Secretary of Defense. "Here are some facts about the AATIP Program...AATIP was funded in the July 2008 Supplemental Appropriation Bill ( a Sen Harry Reid add). Its mandate, as outlined in a 2009 letter from Reid to DSD, was to assess "far-term foreign advanced aerospace threats to the United States. The Advanced Aviation Threat Identification Program ended in 2012. It was determined that there were other, higher priority issues that merited funding and it was in the best interest of the DoD to make a change." The email showed that Harris was a DoD Spokesperson. Portfolio: Special Operations & Defense Intelligence. A search of LinkedIn found a profile for Harris which stated that she was the "Principal spokesperson for the Under Secretary for Defense Intelligence and Deputy Assistant Secretary for Defence Cyber Policy." "AATIP was funded in the July 2008 Supplemental Appropriation Bill (a Sen Harry Reid add). Its mandate as outlined in a 2009 letter from Reid to DSD, was to assess "far-term foreign advanced aerospace threats the United States," including anomalous events (such as sightings of aerodynamic vehicles in extreme maneuvers, with unique phenomenonology, reported by U.S. Navy pilots or other credible sources)." At that time, 3 May 2018, we did not possess a copy of this 2009 Reid letter, mentioned by Harris. However, following the release of a copy of this letter by reporters George Knapp and Matt Adams, it is now possible to check Harris' text against the Reid letter. The words "far-term foreign advanced aerospace threats the United States," are in the letter (with the addition of the word "to" before the words "United States." However, the words "including anomalous events (such as sightings of aerodynamic vehicles in extreme maneuvers, with unique phenomenonology, reported by U.S. Navy pilots or other credible sources)." are not in the letter. Further communications between Glassel and Harris revealed that Harris did not possess a copy of the 2009 letter; and that when Glassel pointed out that the latter words were not in the letter and asked where it was from, Harris responded that she could not give Glassel any further information. Glassel also tried Thomas Crosson, but he never responded to Glassel. I was asked a question the other day. 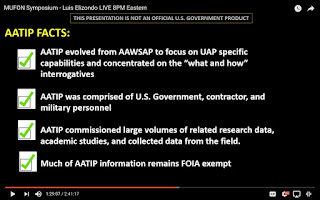 It was "How much official documentation about the Advanced Aerospace Threat Identification Program (AATIP) and the Advanced Aerospace Weapon System Applications Program (AAWSAP), is available publicly?" To answer this question I needed to prepare a list, which you can read below. For a comprehensive listing, and links to mass media material, about AATIP/AAWSAP, I would direct you to the excellent work of journalist Giuliano Marinkovic here. On 18 August 2008, the Virginia Contracting Activity, based at Bolling Air Force Base, Washington, issued a 32 page solicitation/contract/order for commercial items, number HHM402-08-R-0211. The Virginia Contracting Activity is the contracting arm of the Defense Intelligence Agency (DIA). The solicitation was slightly amended, by versions dated 20 August 2008 and 22 August 2008. Attachment 1 to the solicitation, dated 18 July 2008, sets out the program objectives. "The objective of this program is to understand the physics and engineering of these applications as they apply to the foreign threat out to the far term, ie from now through the year 2050. Primary focus is on breakthrough technologies and applications that create discontinuities in currently evolving technology trends." Technical studies in 12 areas were required, including in the areas of propulsion; signature reduction and human effects. The closing date for bids was 5 September 2008. However, despite a comprehensive search of US government solicitations and contracts awarded, including those listed on Federal Business Opportunities; US Department of Defense Contracts; and USA government spending, no one has been able to find a public announcement of the company who was successful in winning the contract. I was, however, able to locate a website snapshot using the Wayback machine which, dated 12 September 2008, provided a listing of careers within the Bigelow Aerospace Advanced Space Studies company (BAASS) which matched those areas of expertise listed in the DIA solicitation. The language used in the preamble to the advertised jobs contained identical words to some found in the solicitation. One can therefore deduce from this, that it was BAASS which was the successful company, even though there was no public announcement. Las Vegas based journalist George Knapp interviewed Robert Bigelow on the coasttocoastam radio show in September 2008, about the work of BAASS. Bigelow, however, did not state that his funding was from the DIA. Knapp, in a 2018 radio interview, also stated that there was only one other bidder for the contract, and this was the aerospace company Lockheed Martin. In the copy of the solicitation I located, areas 17a "Contractor" and 26 "Total award amount" are blank. In the Knapp/Adams version they have been filled in, indicating that Knapp/Adams have, at least. a part of the solicitation/contract which indicates that BAASS were the successful contractor. However, this "contract" has not been fully, publicly released to date. In summary, we have this piece of documentation about the AAWSAP. 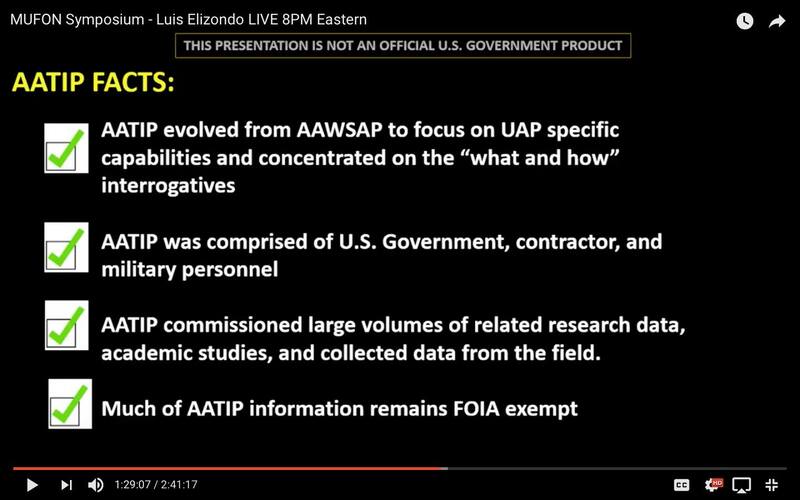 However, it should be clearly stated, that no where in the solicitation does it state that the AAWSAP was to study "UFOs." On 3 April 2018, US researcher John Greenwald received an email from Andricia Harris, MAJ USARMY OSD PA (US). In part it read "AATIP was funded in the July 2008 Supplemental Appropriations Bill (a Sen Harris add.) Its mandate, as outlined in a 2009 letter from Reid to DSD..."
Harris advised Greenwald, that she did not have a copy of that letter in her possession. I decided to look for a copy of the letter in the former Senator Reid's Congressional papers, which I found out were archived at the University of Nevada-Reno. I corresponded with the Harry Reid Papers Archivist, Ian M McGlory, who in an email dated 31 July 2018 advised me that due to the size of the collection "we currently wouldn't be able to find something as specific as what you are looking for." I presented the text of the entire letter in a blog post dated 29 July 2018. In short, the letter stated that in September 2008 Congress had mandated the DIA to assess :...far-term foreign advanced aerospace threats..." This is clearly a reference to the 2008 DIA solicitation re AASWAP, though Reid refers to the program as AATIP. Reid went on to suggest to the DOD that the program become a "Restricted Special-Access-Program." It should be noted, that as with the DIA solicitation itself, there is no mention of the subject of "UFOs." On 7 August 2018, a number of items were revealed to have been sitting on a US website, which were of relevance to our study. 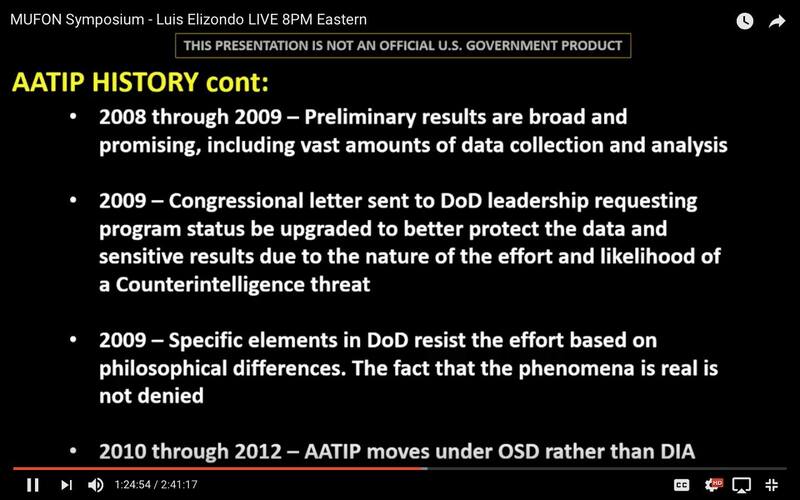 Amongst these items were a series of jpeg images of what appeared to be an AATIP slide briefing presentation. These had never been publicly available before. I wrote up a full description of the contents of the slides in a blog post dated 9 August 2018. 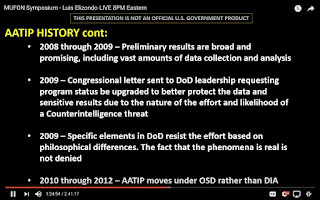 * That the AATIP mission included "To further identify, understand and take advantage of a generation of highly advanced technology and principles..."
* "Preliminary evidence indicates that the United States is incapable of defending itself towards some of these technologies..."
There is reference to items which we read about in the 2008 DIA AAWSAP solicitation, though here in these slides the program is called the AATIP. On a Coast to Coast radio show interview dated 28 January 2018, between George Knapp and Dr Eric W Davis, Davis outlined his subcontractor role with BAASS. One of the things which he and EarthTech International colleague Hal Puthoff commissioned, was a series of 38 expert studies. The DIA prepared a set of Defense Intelligence Reference Documents (DIRDs) from these studies. The DIA documents stated that these were relating to the AAWSAP. A search of the Internet revealed that two of the above Davis DIA AAWSAP documents, were online as early as 18 December 2017 on a website run by US researcher Coorey Goode. A third DIA AAWSAP DIRD surfaced in a report by George Knapp and Matt Adams dated 5 May 2018. The DIRD was authored by EarthTech's Hal Puthoff. How do we know that Davis and Puthoff authored these documents? Davis confirmed this to UK researcher Isaac Koi by email, and Puthoff confirmed this to me by email. In a KLAS TV report dated 25 July 2018, reporters Knapp and Adams published a copy of a list of the 38 DIRDs. The source of the list was not stated, though former AATIP program manager Luis Elizondo confirmed that the list was genuine. I analysed the list in a blog post dated 1 August 2018. You will note that none of these DIRD's mentions the word "UFOs." On 13 October 2017, US researcher John Greenwald submitted an FOIA request to the Department of Defense, for information on the program which he only knew to be called something like the "Department of Defense Aerospace Threat Program." In a letter dated 27 November 2017, the Department of Defense stated that: "no records of the kind you described could be identified." Swedish researcher Roger Glassel located an item regarding the AATIP in the "Congressional Record" which is the official record of the proceedings and debates of the US Congress. "4381. A letter from the Chief, Congressional Relations Division, Defense Intelligence Agency, Department of Defense, transmitting a list of all products produced under the Advanced Aerospace Threat Identification Program contract for the Defense Intelligence Agency to publish, to the Committee on Armed Services." 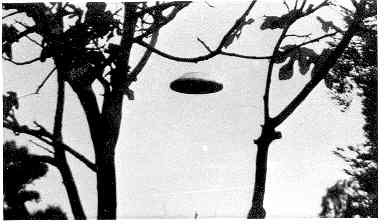 US researcher John Greenwald noticed that the Intellipedia page on the subject of Unidentified Flying Objects now contained a reference to the AATIP. However, the entry contained only public source information, and added nothing new to our knowledge base. It can be seen from all of the above material, that our knowledge of this program has come from a variety of sources; namely; journalists; the former manager of the AATIP; and civilian researchers. It is this collaborative effort, in my opinion; together with the work of such private companies such as To The Stars Academy, which will continue to unearth further documentation. I am aware that there are a large number of outstanding AATIP related US Freedom of Information Act requests, with the Department of Defense; the US Navy; the Central Intelligence Agency; the Defense Intelligence Agency, and other US agencies; which may, in time, add to what we know. I may well have missed some relevant documentation in my compilation above, so happy to hear from any observant blog reader. "AATIP was funded in the July 2008 Supplemental Appropriations Bill (a Sen Harry Reid add). 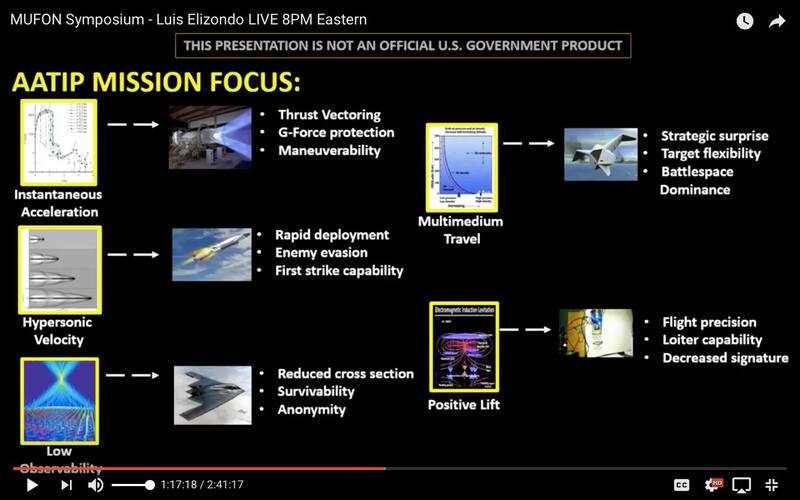 Its mandate, as outlined in a 2009 letter from Reid to DSD, was to assess "far-term foreign advanced aerospace threats the United States, "including anomalous events (such as sightings of aerodynamic vehicles engaged in extreme maneuvers, with unique phenomenology, reported by U.S.Navy pilots or other credible sources). AATIP was terminated in 2012 due to lack of real progress and concerns about the viability of the program." The other day, US researcher Danny Silva tweeted about a new blog post he had written, concerning Hathaway Research International. Danny mentioned that Hathaway Research International was established by George Hathaway, a Canadian engineer, who authored two of the 38 Defense Intelligence Reference Documents, under the EarthTech International sub-contract to the main Advanced Aerospace Weapon System Applications Program contract. 1. "1992-1994 Field investigations of anomalous aerial phenomena for private research institute." 2. "1997 Field investigations of anomalous aerial phenomena for private research institute." 3. 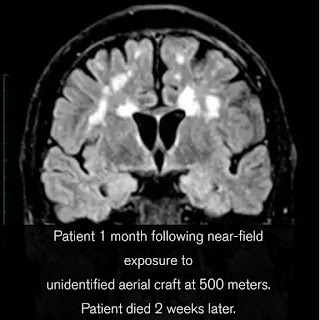 "2012 Analysis of material allegedly from anomalous aerial phenomena for private research institute." Intrigued, by this material, I decided to undertake some further research on George D Hathaway, his work and his research findings. I recalled a blog post I had written in July 2017 about the UAP interests of Hans-Adam II of Liechtenstein. In that post I cited the following extracts from Jacques Vallee's "Forbidden Science: Volume three." "Hyde Street Thursday 18 May 1989. Crown Prince Hans-Adam von Liechtenstein was in town yesterday with his consulting engineer from Toronto, a man named George Hathaway who helps him study the phenomena with the hope of discovering new forms of energy production..."
Hyde Street Monday 22 June 1989. George Hathaway, the Canadian engineer who works with Liechtenstein, tells me he has been making contact with all leading UFO researchers who had ideas about energy or propulsion systems at the request of the Prince, who is also sponsoring studies on abductions...He gave me some insight into his (and the Prince's) theory there is an extraterrestrial force that is monitoring and controlling man's drive into space. "It's a question of how far we'll be allowed to go before some other entities put the lid on what we do with our little rocket firecrackers. We have to be prepared for certain pressures. Space is not the beckoning, wide open, new frontier people dream about. "...Hathaway in the meantime, investigates Tesla phenomena and alternate energy devices and lectures on such topics." Liechtenstein Saturday 4 November 1989. Jacques and Janine Vallee visit the Prince at his home in Liechtenstein. "Prince Hans-Adam is spending small amounts of money (a few tens of thousands of dollars, he said) validating experiments in free energy that he claims, are generating more watts than they put in. George Hathaway, who is well qualified, is in charge of these validations..."
"1989 Spence 'ECT' device. An electron cyclotron device allegedly capable of "over unity" energy production." "1989 Boday magnetic flux- switching energy device for private client." "1990 Investigation of Chernetskii hydrogen arc-based energy device in Moscow for private client." "1990 General research into arc-based anomalous energy production claim for potential investor." I came across a reference to "Hathaway, George D. "Report on Preliminary Investigation of Anomalous Phenomena in Western New Mexico" Toronto, Canada. Hathaway Consulting Services, on the Internet, but have not been able to locate a copy. "1992-1994 Field investigations of anomalous aerial phenomena for private research institute." The active years for the Bigelow Foundation were 1992-1994, so I wonder if this foundation was the client for Hathaway? In the book, "Mysteries of Ontario" authored by John Robert Colombo, Dundum, 1999 p.235, the author describes the abduction claims of one Betty Stewart Dagenais from Canada who reported abduction experiences occurring between 1925 and 1979. In a 1959 incident she claimed that aliens had implanted a device in the back of her left ear. It was removed in 1988 in hospital. Colombo reports that in 1994, George Hathaway examined and tested the implant which was described as 1mm by 1.5mm aluminum, silicon, titanium transducer. On the Hathaway Research International "Our past research projects" area there is an entry for 1996 which reads "Podkletnov spinning superconductor gravity experiment for potential investor showing null results to accuracy grater than Podkletnov published." Podkletnov claimed to have found a 1-2% loss of weight using a spinning superconductor. 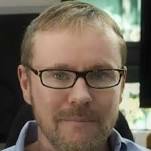 In 2003, Hathaway published his results in Physica c, 385, 2003, pp488-500. "1997 Field investigations of anomalous aerial phenomena for private research institute." The National Institute for Discovery Science established by Robert Bigelow was active in this year, so I wonder if they were the client? Given all the renewed interest in the claims of Bob Lazar, it is interesting to read a four page paper by Hathaway titled "Engineering Views of Lazar's Anti-Gravity Physics" which "...will analyze some of the so-called "anti-gravitational physics" from a conventional engineering and physics perspective." "Analysis of material allegedly from Anomalous Aerial Phenomena for a private research institute." This brief notation interests me, because I have just compiled a catalogue of "fragments" reportedly from UAP. I have not been able to find out more about the Hathaway analysis. An "Advanced Propulsion Workshop" was held between 20-22 September 2016 at Estes Park, Colorado, USA. Hathaway presented a paper titled "Experiments with novel propulsion ideas"
A copy of the Proceedings are available. It is an excellent review in some detail, of many of the devices discussed on the Hathaway Research International website's "Our past research projects" area. An addendum paper was presented by George Hathaway. It was titled "Nightmares in the art of measuring" and explores the multiple issues when attempting to validate devices claiming anomalous results. The paper discusses the possibility of extraterrestrial communication through the means of telepathy. "In the paper we have tried to identify the important issues involved in authenticating claims of telepathic contact with extraterrestrials." The acknowledgements state: "The authors are grateful to Kit Green and Harold Puthoff for making some very useful suggestions." 1. "A metallic implant has been found." Flying Saucer Review, Volume 39, Number 2, Summer 1994, page 26, by L J Fenwick, Canadian UFO Research Network. 2. "Implant probed in Canada by scanning electron microscope." Flying Saucer Review, Volume 40, number 4, Winter 1995, by L J Fenwick, Canadian UFO Research Network. In 2017, US journalist Annie Jacobsen authored a book titled "Phenomena: The Secret History of the U.S. Government's Investigation into Extrasensory Perception and Psychokinesis." (Back Bay Books, New York.) Pages 394-400 discuss the work of Dr. Christopher (Kit) Canfield Green, and Dr. Garry P Nolan. When interviewed for the book, Green describes one area of his work "I'm interested in the notion of people injured physically by anomalous events....Often these events are perceived as (involving) unidentified aerial phenomena, or UAPs..." (p.396.) When speaking of his patients in this area, he states "They are all high functioning individuals, many prodigious savants..."
Jacobsen quotes Nolan as saying "Some people (seem to) repeatedly attract the phenomena or the experiences...They act like an antenna or like lighthouses in the dark." EarthTech International is a private company with a research Division, the Institute for Advanced Studies at Austin (IASA.) IASA was founded by Hal Puthoff in 1985, and was incorporated under the name EarthTech international in 1991. Its website describes several areas of interest including one titled "Life Sciences." IASA consults for both public and private clients. The website advises that "EarthTech International and the Institute for Advanced Studies in Austin actively engage in numerous collaborations with industry, the US government, scientific research foundations and academia. We also collaborate with non-profit scientific research institutes such as the Tau Zero Foundation, the Fetzer Institute and Icarus Interstellar, Inc."
"An important direction of IASA for the past decade has been the Emergent Life Sciences. Specifically our network of forensic physicians and clinical specialists in Genomics, Immunology, Neurology and Neuroimaging have several clinical translational medicine research sponsors. Our goal: The forensic diagnosis of enigmatic illness, treatment, protection and improved patient well-being using the latest Neurosciences and Genomics. Institute medical scientists have mapped emergent evidence of correlations between energy sources and the life sciences in discovery of new injury diagnostics after patients have been exposed to unusual near-field anomalous effects believed related to advanced or experimental propulsion, or unknown devices under test and evaluation." Comment: The content of the last paragraph above, seems to be describing the exact type of work being undertaken by Green, who is a forensic physician. * Studies of Brain Biomarkers and related heritable DNA related to high performance, cognition, learning and intuition when under stress. 1. The last paragraph above, would seem to me to relate closely to Nolan's work on Green's patients, as described by Jacobsen. 2. Note that the three areas above. are listed under "Current client interests" i.e. someone ( a client of EarthTech) is interested in these areas. A "client" is suggestive of a contracted piece of work being undertaken by EarthTech on behalf of a "client" i.e. an industry body, the US government; scientific research foundation etc. One of the speakers of the recent 2018 Space Genetics Symposium, organised by the Consortium for Space Genetics, Harvard Medical School, Harvard university, was Dr. Garry P Nolan. The title of his talk was "Can genetic differences in intuition and cognition drive success in space?" Note the title of Nolan's talk, and one of the IASA's "current client interests" is about (high performance) cognition and intuition. Thanks to Twitter user @Jay09784691, I found out that Green and Nolan are not the only mainstream researchers interested in links between genetics and exotic phenomena. The Institute of Noetic Sciences in the US have a current project exploring this area. The abstract page above states "This project is taking longer than we originally expected to complete...we are dependent on our geneticist collaborators to finish that portion of this study." Who are their geneticist collaborators? The answer is to be found on page 4 of the PDF document. It is Garry Nolan of Stanford University. Pattern one is that some people who have a close encounter with UAP incur unusual injuries. So Green is checking out the DNA and immune systems of these people. Rendlesham Forest, (1980, United Kingdom) witness John Burroughs, is one person who has openly spoken of giving DNA samples to Kit Green. Pattern two is that some people repeatedly attract the phenomena, so check out their DNA and immune systems. In "Phenomena" Nolan (P.399) refers to "Some people [seem to] repeatedly attract the phenomena or the experiences..."
Pattern three is that individuals who have close encounters with UAP report associated paranormal phenomena at a rate higher than the average population, so check out their DNA and immune systems. 1. Who is funding the work of Green and Nolan in these areas? 2. Who are the clients of IASA who are interested in "Interaction of novel energy and propulsion systems causing both Epigenetic injury and Central nervous System Pathology?" 3. What was the significance of the brain scan image below? The image was once to be found on the EarthTech International website, under the "Life Sciences" area, but when UAP researchers pointed it out, the image was removed and has never been replaced back on the website. The classic Canberra Airport sighting of 1965 - UFO or Venus? I am continuing my examination of the scanned copies of material, arising from Boston, USA, researcher Barry Greenwood's recent visit to the archives of the J. Allen Hynek Center for UFO Studies in Chicago. 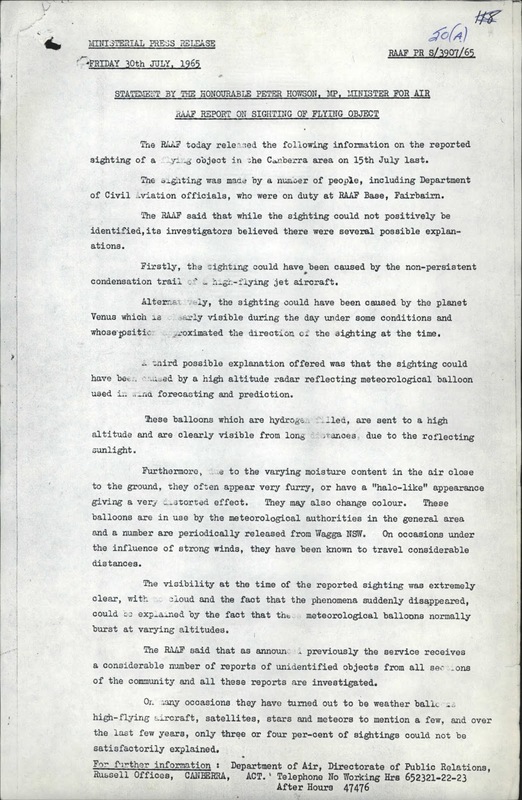 One Australian case from 1965, which features time and time again in the UFO literature, happened on 15 July 1965, where a number of staff at the Canberra Airport reported watching an unidentified light in the sky during broad daylight. In a series of blog posts dated 29 September 2011; 11 December 2011; 9 January 2013; and 15 December 2013, I reported on the information on this sighting gathered from a number of sources; both from Australian government files and newspapers. "Everyone I spoke to here said they were certain that flying saucers don't exist, but they would sleep a little more easily at night if someone could prove what "the thing" was." "The officer-in-charge of Civil Aviation in Canberra, Mr A B Lindeman, said: 'I wish Mt Stromlo would tell us it was a planet. I don't like something in the back of my mind I can't understand.'" "Dr D B E Westerlund of Mt Stromlo's observatory said that if the light was coming from the north-east it would almost certainly be the planet Venus." "Mr Lindsay said: 'I've been in the job for two and a half years and I've never seen anything like it before...It wasn't Venus as has been suggested. I'm sure of that from the position..."
A large range of international and newspaper also carried reports of the sighting. It must be recalled, that in 1965 there was a wave of sightings in Australia, so interest in the topic was already high. "Rhodesian Herald" - 21 July 1965. "Three flying objects reported at Canberra." "The Times and Democrat" (Orangebury, SG, USA.) - 16 July 1965. "Could it be Martians?" "San Jose Mercury" - 16 July 1965. "Mystery glow seen at airport." "Atlantic City Press" - 16 July 1965. "UFO hinders Mariner signals." "New Zealand Herald" - 21 July 1965. "Mystery of flying object remains unsolved." "Seattle Times" - 17 July 1965. "'Object' reported over Australia." "Vancouver Sun" - 16 July 1965. "Mariner men goggle at glowing creepy." "San Francisco Examiner" - 16 July 1965. "Mystery of UFO spreads." Barry's work shows that literally dozens of articles about the sighting appeared in other international newspapers. 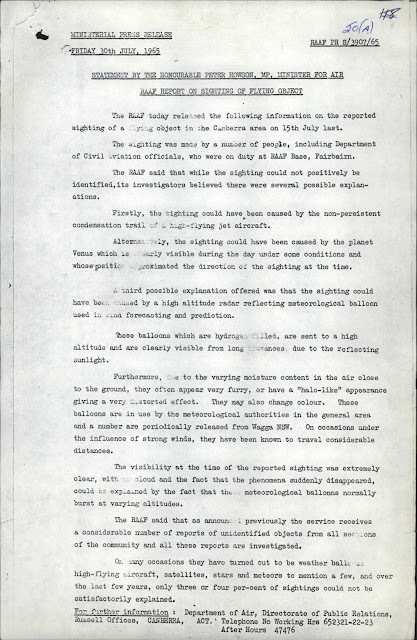 After the initial wave of newspaper articles, only a few carried the results of the official RAAF investigation of the sighting. I will quote two newspaper articles below, which feature opposite and contradictory view points. In one, the object is identified; in the other there is failure to identity the origin of the object. "Telegraph" Brisbane, Queensland dated 30 July 1965. Canberra - An unidentified flying object seen high in the sky near Canberra on July 15 is understood to have been identified as a large weather balloon. An investigation by a security team from the Royal Australian Air Force is believed to have dismissed the likelihood that it was an intruding aircraft." "Advertiser" Adelaide, South Australia dated 31 July 1965. Canberra - July 30 - An RAAF investigation team has failed to identity a mysterious object seen hovering north-east of Canberra airport on July 15. The RAAF report released today, suggested it was probably a high altitude meteorological balloon of a type periodically released at Wogga in NSW. The balloons could be seen from a considerable distance, often had a halo like appearance and sometimes appeared to change colour. Other explanations offered by the investigation team are that the object was a brief condensation trail from a high flying jet, or the planet Venus." Thank you again to Barry and CUFOS for this historically invaluable material. 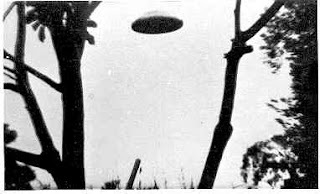 Since the late 1960's I have been aware of a series of four UFO photographs (three of which I have images of) said to have been taken in Adelaide in 1969. I also recall seeing a completed UFO report form, compiled by the photographer; in the collection of the now defunct Australian Flying Saucer Research Society, although a search of my computer files failed to find a copy of this form. Imagine my surprise upon going through copies of documents scanned by US researcher Barry Greenwood, to find a copy of the original report form, from Barry's recent visit to the archives of the J. Allen Hynek Center for UFO Studies in Chicago. On the form, the photographer David Bryant, gave his age as "21;" his occupation as "butcher;" and his then address as "5 Alan Avenue, Campbelltown" in Adelaide, South Australia. However, he stated that the place of the sighting was "Devon Park, Western part of Adelaide." Weather conditions at the time were given as "misty cloud." The date of the sighting is given as "Early June 1969" and time as "6 to 7am." The object was first seen at an angular elevation of 35 degrees. It's light attracted his attention; as well as its movement. The object appeared as a "solid object - glowing as a series of light bulbs." It was in view for three minutes. Asked for an "opinion on propulsion," he wrote, "No idea but lights revolving very fast." To "Details of structure and shape" he wrote "A mass of spinning lights." Speed was described as "very fast." Height "35 degrees up" and size "10 to 12 feet." Distance "300 feet." Sound: "None what so ever." Colour "A glare of lights." Object disappeared: "seem to be receiving (sic) rapidly." Do you have any fragments, photographs? "Photos." Name and address of any witnesses: "As above. My wife." A sketch shows the object was to the south-west of the observer. Under additional information: "Dog was barking in house. Let dog out but shot back in quickly to the house and turn in instinct to look up and there it was. I thought it was just a hangover but I had not been drinking so took the photos which I didn't think there was any results." The form was dated and signed on 30 July 1969. I am not aware of any detailed investigation report on either the series of photographs, or the sighting. Boston researcher Barry Greenwood recently returned from a two week visit to the archives of the J Allen Hynek Center for UFO Studies in Chicago, in the USA. Barry kindly forwarded copies of scans of documents relating to Australia, to both myself and also to Melbourne researcher Paul Dean. Paul and I are spending time looking through all of these documents to determine if there is previously unknown material in them. I wish to thank Barry for his untiring efforts in the preservation of these invaluable historical records. 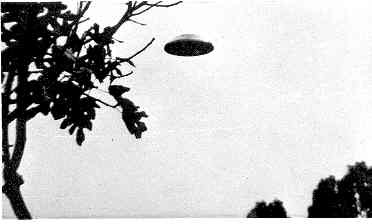 "A very good friend in Sedalia informed me last November (1968) that his uncle had taken photographs of an unusual object during the spring of 1965. The observer was flying in a converted B-52 aircraft on an international aerial mapping project. The aircraft was flying over Australia. The aircraft was flying at a slow rate of speed and the bomb-bay doors and the side doors were open. There were cameras mounted in the bomb-bay section to photograph the terrain below. The observer saw the object approach the B-52 from slightly behind. It appeared less than a mile away and started pacing the aircraft. It did so for about 2 minutes. During this time the observer snapped 3 photographs with a small camera he had to hand. At least one other crew member saw the object also. The object disappeared at a high rate of speed. My friend, mentioned above, saw the photographs about 4 years ago, just after they were taken. On 4 inch by 5 inch prints, the object appeared to be a disc, white in color, not reflective, a raised area was visible on the top section. On the 4 inch by 5 inch print the object was about 3/4 inch in diameter. It is not known if the print was enlarged a great deal. As of this date, June 7, 1969: the observer is still in the Air Force and is stationed in Illinois. My contact asked the observer about releasing the negatives to us January 1, 1969. At that time the observer was still in the process of moving from Puerto Rico to Illinois and said that as soon as he had the negatives he would send them. Shortly after this he became ill and was in hospital in St Lois, Missouri for several weeks. The observer's furniture was shipped to St Lois. The observer then did move to Illinois and as of May 30, 1969 was still trying to track down his personal effects. He will be here in Sedalia July 4 and it is hoped that he brings the negatives at that time. The observer does not want his name used."